The animated buddy comedy is a well-worn format at this point, with pairs ranging from Ren & Stimpy to Cow And Chicken to Billy & Mandy. The genre has endured, largely because it’s a sturdy foundation for all kinds of wacky adventures—as long as the audience can hang on to the two main characters, you can do pretty much anything else you want. 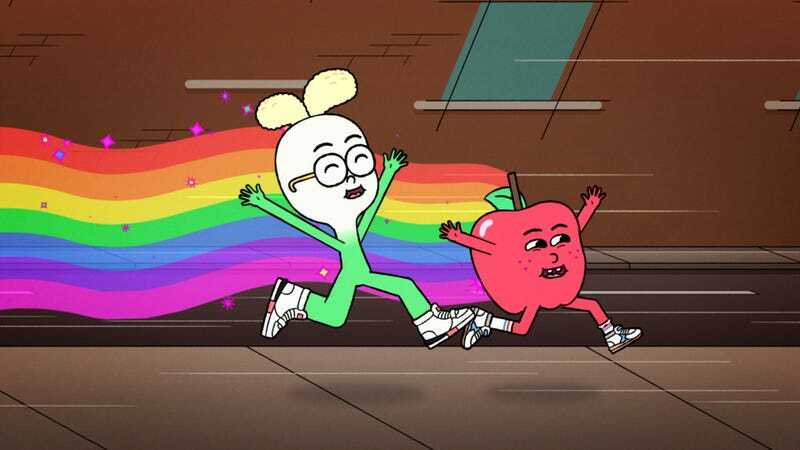 That’s the idea behind Apple & Onion, Cartoon Network’s new 10-episode limited series from George Gendi, a former storyboard artist on The Amazing World Of Gumball and Nickelodeon’s Sanjay And Craig. Apple & Onion isn’t trying to reinvent the wheel, but if you’re at all a fan of classic animated duos, it’s a pretty great snack. Quarter-hour animated comedy. First two episodes watched for review. Apple and Onion aren’t quite as differentiated as two halves of the central pair as they could be, at least not in the first two episodes—instead, the show spends a lot of time showcasing the qualities they have in common. Where the two of them are silly and committed to fantasy, everyone else around them seems to be mostly normal (even if they are foodstuffs), including a droll, startup-style office where Onion is originally supposed to work until he gets fired by his boss, Instant Coffee, and a group of children who have their own, magical society. But Apple and Onion discover they both have a talent for spur-of-the-moment musical performance, fly sneakers, and video games. Two goobers who bond over their love of improvised singing, inadvertent commitment to being childish, and arcade-style games—this should sound familiar, if you’re a Cartoon Network fan. There are definitely shades of Regular Show in Apple & Onion, mostly in the basic building blocks both shows use to build their worlds—two somewhat immature friends who are trying to make their way in a fantastical, but still largely realistic city. And the second episode, about Apple adopting a cat and prompting an insecurity spiral from Onion, is boilerplate as far as this kind of show goes. That’s the kind of thing that could potentially grow cloying over the course of a multi-year run—but with a limited run of 10 episodes, it’s hard to imagine Apple & Onion overstaying its welcome. And thankfully, Apple & Onion has a rather pronounced self-aware streak. Over the course of the first episode, Apple helps a bunch of people and, according to the logical dictates of this plot, they eventually help him achieve another goal (finding a lost backpack). The jokes themselves are pretty funny, using the culinary setting to come up with some creative uses for bacon grease, but the real treat is when Apple and Onion openly acknowledge how they think the plot is supposed to go. The joke could come across as being frustrating in its smarminess—either avoid or lean into tropes—but Apple & Onion manages to move through it so quickly that it works. Apple & Onion knows that you know what kinds of stories it’s going to tell, and ultimately it doesn’t really care: They’re just too much fun.